The ideal solution for families who enjoy a beach holiday. Situated on the margin of the pedestrian area of the town, Residence Du Parc ***, inaugurated in the year 2000 by the family Battarra, overlooking the boulevard that runs along the sea a few steps from the famous dancing fountains and the famous marine park “. The central location on the sea and proximity to a supermarket makes Residence Du Parc *** the ideal solution for families who enjoy a beach holiday. 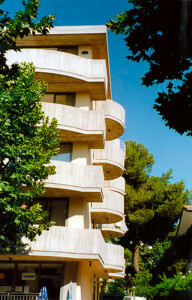 The home has 33 comfortable and functional apartments, elegantly furnished and equipped with terrace and big windows that make them very light.Residence Du Parc *** has reception desk, terrace garden, lift, (private access to guests only with security code) parking, internet wireless connection, cabins on the beach and corner facilities for waste collection including recycling facilities. The warm welcome of the owners on arrival and their daily presence at reception desk, provide efficient service in every moment of the day. For guests of the Apartments du Parc***, preferential access to the restaurant of our Hotel Pinocchio. Every night, Patrizia, our cook, gladdens the palate with typical dishes of Romagna gastronomy. Cattolica, also called the “Queen of the Adriatic”, is located on the extreme southern tip of Emilia Romagna, where the plains give way to the hills of the Marche. The town lies on a wide bay with a particularly favorable microclimate. A wide beach, pedestrian areas with water fountains and lights, a theater, outdoor arena, characterize and enliven the stay in this charming town.